Atlantic City is one of the most popular wedding destinations among brides and grooms in South Jersey. It boasts spectacular ocean views, grand exquisite wedding venues like One Atlantic, Atlantic City Country Club and The Claridge Hotel. As New Jersey wedding photographers, we enjoy traveling all over the state to document weddings and engagements and explore new locations. It is always a privilege to be trusted by our brides and grooms to tell their story through the photographs and be a part of their life's most special event. This photograph of our gorgeous bride Ali and her dad was taken minutes before she walked down the aisle to see her groom for the first time. They were having a quite moment and chatting about something funny. It was a beautiful moment of anticipation and great excitement. There was absolutely no need to pose anything or provide any guidance. 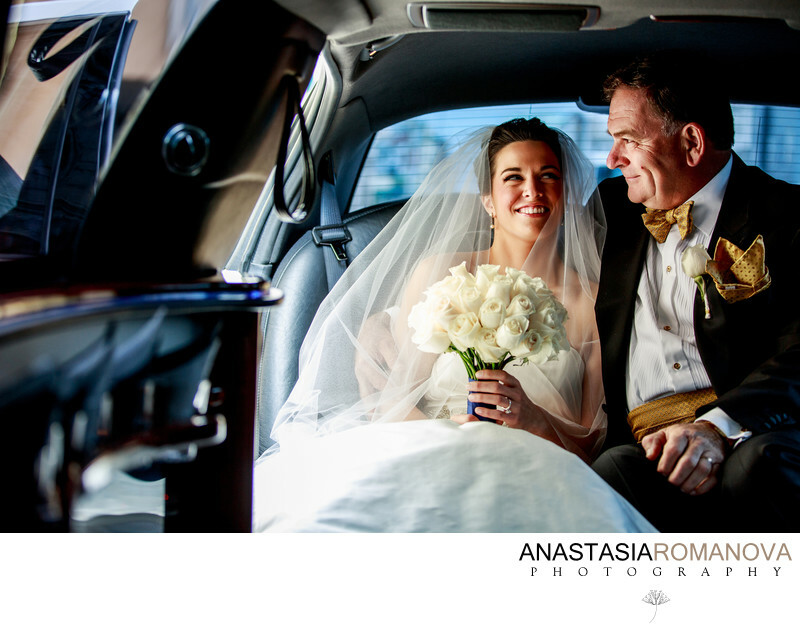 The limousine's door was already opened and gorgeous light was hitting their faces, the flowers and the bride's veil. We were lucky to have a very warm, glorious sunny day, even though it was the middle of October. I love how loving and caring is the look on the dad's face and how joyful and luminous is the bride. These are those small intimate moments that will be cherished and preserved for generations to come. Canon 5D Mark III, 70mm; f/2.8: 1/200 sec.